This is the story of a 12 year old girl from West Godavari district who had come to LVPEI two years back for treatment. At the time the child was brought to the Institute, she was already blind in one eye. On evaluation, the doctor had found that even the good eye was also going to go blind. To make matters worse, the young 30 year old mother had recently been widowed. In the course of the next year, all the required retinal examinations were conducted for the child but to no avail. Despite the best efforts in terms of treatment, the child's second eye also too was lost to the blinding condition she had. The child’s uncle who was accompanying the patient understood the problem and explained it to his sister the young mother, in their native tongue. However, Dr.Subhadra Jalali, the consulting doctor, did not confine herself to offering medical treatment but walked the extra mile to rehabilitate the child and help the family. She not only took all the care to explain the problem to the uncle who escorted the young mother and her child, but also took to counseling the family. She also referred the child to LVPEI's Centre for Rehabilitation that arranged for the little child to go to a school for the blind. Eventually, upon the advise of Dr Jalali, the family moved to Hyderabad to better avail the facilities. A very concerned Dr Jalali spoke to the young mother, suggesting they consult another physician if in case they were unhappy with LVPEI. After all, they had been unable to save the child's eye, and Dr Jalali had to communicate to the mother with the help of her brother who would translate Dr Jalali's words into their native tongue. But to Dr Jalali's surprise, the young mother laughed away Dr Jalali's concerns. She said that she was very happy that her child was able to continue her education despite her blindness. Thanks to the help and guidance from the institution, she now had something to look forward to in life. "I know you care," she said, underscoring what Hunter Patch Adams said: You treat a disease, you win, you lose. You treat a person, I guarantee you, you'll win, no matter what the outcome. 71 year old Korrapati Swathanthra Bharathi Devi from Chodavaram village of Krishna district was afflicted by bone T.B. To make matters worse, both her eyes were afflicted with cataract, completely affecting her vision. She had difficulty even in carrying out her day-to-day activities. 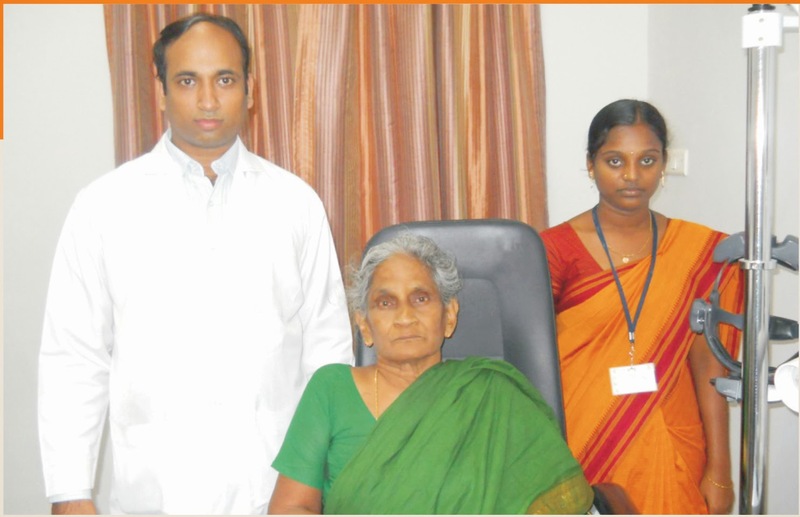 Then she came to L V Prasad Eye Institute in Tadigadapa, Vijayawada. Here, Dr Pradeep Reddy provided two phases of treatment. The first surgery improved vision and the next surgery did the same in the other eye three months later. Though her body did not cooperate well to begin with, through the doctor’s help and counseling and the state-of-the-art facilities at the operating room, she could overcome the difficult situation. Post the operation, she is happy and relieved to have regained complete vision. She not only goes about her daily chores but is also able to read the newspaper with ease. She says LVPEI has been a boon in bringing to the doorstep of the poor the benefits of advancement in science and technology. She also heaped praise and expressed her gratitude to Dr. Pradeep Reddy and counselor Malleswari who meticulously provided advise and counseling even on phone. This is an inspiring story of a 58-year old gentleman, Mr. Banabasi, of Ganjam district, Odisha, who had lost hope due to glaucoma. He came to LVPEI Bhubaneswar when he was completely blind in his one eye and had 20/50 vision in the other eye with severe visual field loss. Mr. Banabasi came from a very poor socio-economic background and had a small Kirana shop to eke out his living. His life was a saga of poor visual skills and constant discomfort. He had boarded a train from his native place Berhampur, travelling without money to Bhubaneswar. However, thanks to the free treatment he received at LVPEI, he started to see new light in his life. His eye problems have been taken care of by the glaucoma consultant and he was further rehabilitated in the vision rehabilitation center. He was advised to use a low vision aid and introduced to other services like orientation and mobility training, technique of currency identification and was also provided government assistance through a certificate for the visually challenged. Now he uses the low vision aid and is able to see the price tags of different materials at his shop. He is very happy to be able to read the Bhagvad Gita on his own. He expresses his immense gratitude for the support provided by the staff at the Institute. He feels that the Vision Rehabilitation Center at Bhubaneswar occupies a special place in his life. Regaining useful sight after living in a world of darkness is nothing but a miracle in Mr. Banabasi’s life.